So another wet, cool, dull fortnight! We have endured 119mm of rain in this first two weeks of July, far more than plants need in midsummer. July’s average is 71mm here… for the whole month. And the average temperature has been 14C, lower than in September. Even free-draining soil has been having its air pores temporarily but regularly filled with water, meaning that growth slows. 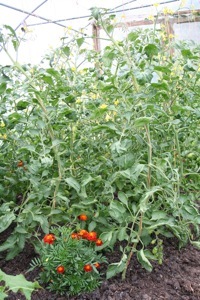 Also the abnormally low temperatures, especially by day, have meant that plants which need a specific level of summery warmth to prosper, such as cucurbits, French and runner beans, tomatoes and sweetcorn, have been scarcely able to grow, at risk of being eaten by slugs as they cannot mount their usual defences. After a storm on July 13th, water pouring down on right, new planting of fennel. Courgettes were fleeced and are giving some fruit! Sorry to be so cheerful and I hope that by the time you read this, the weather has relented a little. If not, and if you have been experiencing difficulties lately, be assured that it is an exceptionally difficult season and highly unusual. Even in polytunnels, growth has been much slower than usual; for example, most of my tomatoes are bearing some fruit but are a fair way off ripening, while cucumbers have only just begun cropping. My chili and pepper plants are small and only just flowering! Outdoors, I have found fleece invaluable to bring on plants of courgette for example, which have been cropping for a month. 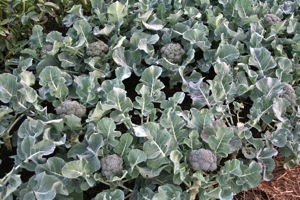 Cauliflower were planted late March and are cropping, no caterpillars! Peas are Alderman and are also giving a fair harvest. Traditional British vegetables such as broad bean, pea, cabbage, lettuce and spinach have thrived, first early potatoes cropped well and we have just harvested second earlies, as their first few leaves were affected by blight, and we found that slugs were amassing, mostly near the soil surface. 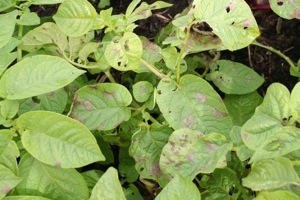 In heavy soil especially, potato tubers are at high risk of being holed this year, or blighted, so there is little point in delaying harvest, once plants have flowered. Blight on leaves of first early Swift. Its growing finished and the tubers are good, in compost/manure on top of clay. Slugs are becoming far too numerous and I am cutting many new ones in half most mornings before starting to harvest, sometimes in the evening too. Whatever your preferred way of coping with them, slugs need attention now or we shall be looking at empty beds quite soon. In my experiment this year, vegetables have been healthier and stronger on the undug beds, except for cabbage which is interesting because it uses less or no mycorrhizal fungi to develop its roots, a clue to the success of no dig: all of the soil’s helpful organisms such as fungi, protozoa, beetles and worms are left undisturbed and can be busy and multiply without any interference. 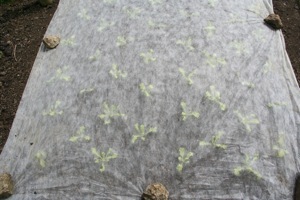 Especially when they are fed with compost on the surface, in which seeds and plants are set out. A bonus is that slugs appear less comfortable in a top layer of compost bits such as tiny pieces of wood, bones and garden debris, compared with the smooth surface of clay on the dug beds, where for example I lost over two thirds of the March sowing of carrots to slugs, while half the carrots on the undug bed have survived. 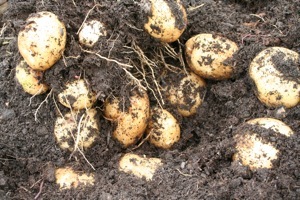 Potatoes in the dug soil were also more slug damaged than in the undug soil, and harder to clean of the sticky clay: both five foot rows were “earthed up” with a bucket of well rotted cow manure, a way of growing them in less space, when there is no spare soil for pulling around the stems. 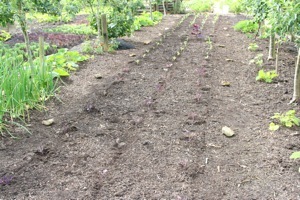 After storm July 13th, dug bed on left, undug on right, celeriac in front: new plantings of kale between lettuce. New planting of kale, brussels, cabbage after beans and garlic. This leaves the soil in good heart after potatoes and I have now planted French beans, although am worried about potential slug damage to them, unless the sun returns. 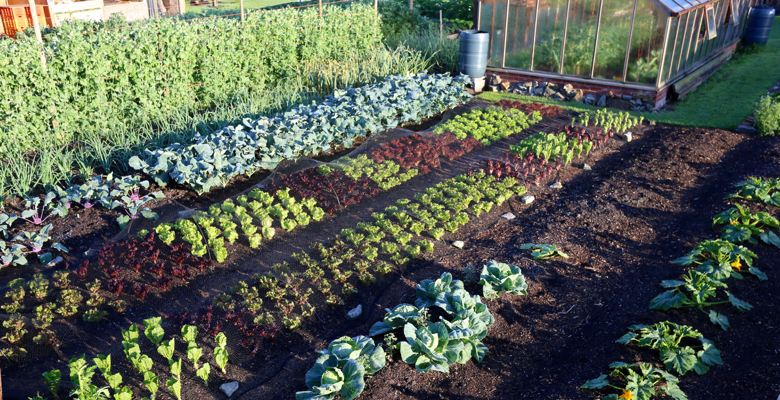 Other second plantings over the next month include kale among/after lettuce, endive after beetroot, salad rocket after peas and land cress after onions, which are still growing strongly thank goodness. I worry about mildew on onion leaves, shown initially as a faintly visible grey mould which soon turns leaves yellow, after which growth ceases and bulbs need eating quickly before they rot from the neck down. If you suffer this, try not to grow any autumn planted bulb onions which harbour the mildew over winter; but on allotments it needs everybody to agree to grow only spring sown or planted onions. Looking ahead to whatever may happen next, I think it best to be prepared for more rain and coolness by sowing hardy salads for autumn such as endive, land cress, rocket and mizuna now, then winter purslane and lambs lettuce in August. 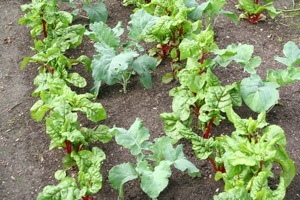 You can also sow spinach, turnips and winter radish over the coming month. 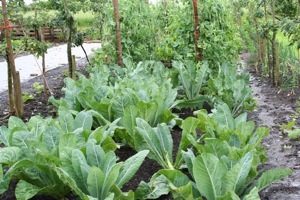 If you have or can buy plants, there is still just time to plant kale, savoy cabbage and beetroot. Slug patrols are vital, as is keeping on top of weed growth at all times in order to maintain some order in the watery chaos, and to give less homes for eager slugs, the main beneficiaries of this dark, damp summer. TIP garlic needs harvesting as its usual rust turns rotten in the damp, don’t delay, trim off the rot then put bulbs somewhere dry and well ventilated. 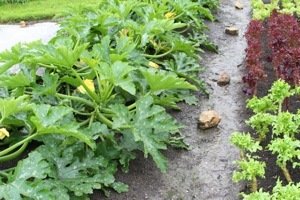 June was a difficult month for growing vegetables: too wet, too dull, too cool. I have heard that even Riverford are worried. 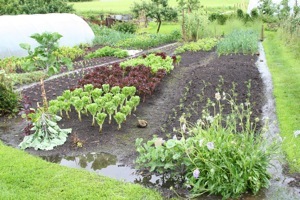 A brief warmer spell in the last week has helped plants to grow a little, as long as they have managed to stay ahead of slugs, whose numbers are not diminishing. Whatever your normal slug remedies are, they need reinforcing now in this combination of moisture and warmth. All habitats such as the undersides of wooden boards, plant trays, stones, sunken pots of beer, overhanging leaves and decaying leaves as on hearting lettuce can be checked and any slugs chopped or removed. Reducing their numbers like this is more effective than creating barriers of eggshell, coffee grounds or whatever, which may be effective for a while but are often breached in the end. Plants you want to set out can be kept a few days longer to ‘toughen up’ in their pots or cells, even to the point of discolouring a little as they run low on nutrients. Slugs seem less interested in older plants, as long as they are basically healthy. 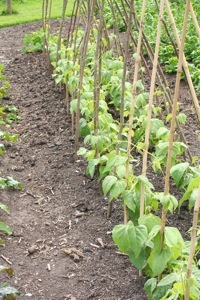 Borlotti beans are finally growing, slowly. 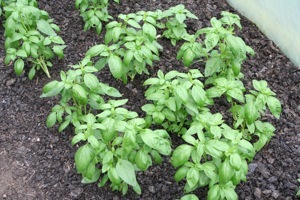 As is some sweet basil in a polytunnel, which has been lightly picked. 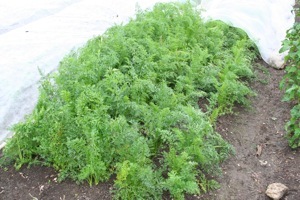 Carrots sown on March 8th have done better than April sowings. They were fleeced and are now meshed. 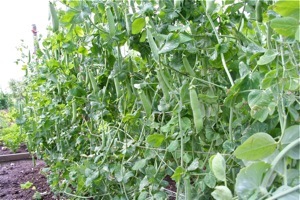 Tall Sugar snap peas sown mid March in modules. Calabrese Belstar sown Feb, planted 24 March & fleeced. 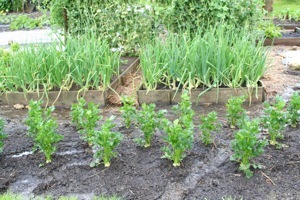 My peas and broad beans have enjoyed the Atlantic weather, especially peas which like plenty of moisture. 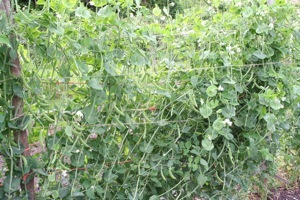 Tall sugar snaps are six foot high and were first picked on 27th June, also I pinched out their tops for salad at that time. Last year the first pick was on 13th June. I have just finished picking from overwintered Aquadulce Claudia broad beans and plants from a February sowing are coming ready to take over from them. Chocolate spot was bad on some Aquadulce sown late October (see forum topic) but leaves were clean on a sowing in mid November; I think the warm autumn made the earlier sown beans too forward and they were then weakened by February frost. Calabrese Belstar planted in March (sown late January indoors) has just finished cropping and Purple Graffiti cauliflower are making nice heads now, with no caterpillar damage, partly thanks to the wet and windy weather which butterflies do not like. 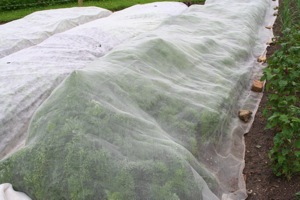 Because of the weather I kept a fleece cover on courgettes and squash for longer than usual, and it paid off. 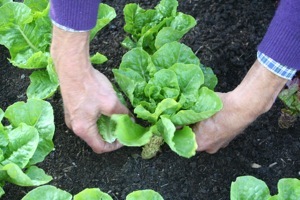 Picking Little Gem lettuce for its outer leaves, for the eighth week. In most years at this time I am planting lettuce and endive for summer but this year the plants are late as an early June sowing grew poorly in West Riding compost. A second sowing in sieved cow manure and some West Riding grew much better (thanks to more air in the compost I think) and plants will be ready to go out in early July, ten days later than usual, causing me worries about maintaining a succession of leaves to all my outlets. 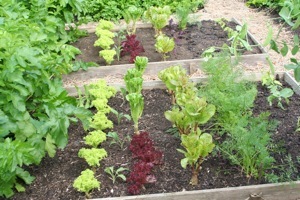 So far this year, sales have been excellent and there has been less watering than usual of salad beds! This endive was planted ten days ago. 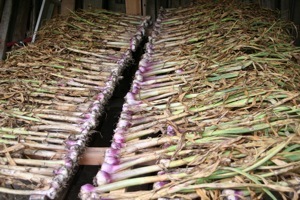 The garlic was harvested on the same day, is drying under a barn, roots trimmed. Weeds have enjoyed the continual moisture but no dig has been a great help in these difficult conditions and I have found again that after hoeing and weeding the first flush of weeds in April, only a few have come up since then. So all paths and beds can be kept clean as a whistle with occasional and extremely quick weeding, mostly by hand. Currently there are dandelions emerging from seeds which blew in and you just need to keep an eye out at all times for the newcomers. Edging of grass needs doing at least every three to four weeks if you want to avoid a much bigger job and the speedy, unobtrusive encroachment of grass edges always amazes me. 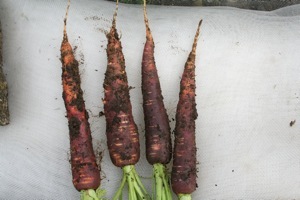 Purple Haze carrots grown in undug clay. Sowings in July are mostly towards the month’s end, except for bulb fennel and beetroot (now!) and radicchio chicories to heart which want sowing from now until mid month, of varieties such as Palla Rossa Marzatica (from Seeds of Italy). It makes a heart which stands well in autumn and the leaves are lovely in salads at that time, when lettuce is becoming scarce. 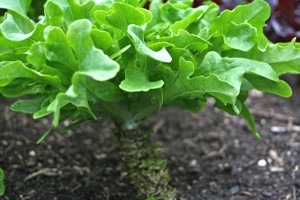 Endive likewise and its sowing season is longer: sow now for hearts in September , and in early August for hearts in November, or you can pick or cut leaves off younger plants, though they are then more bitter. 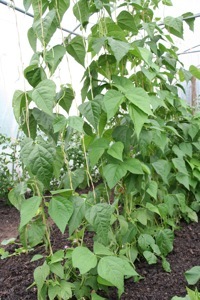 Cobra french beans are ready to pick. 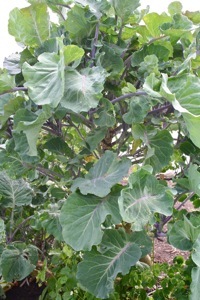 Perennial kale Daubentons is prolific and is one of the small number of vegetables to enjoy the cool, wet and windy weather!